The Republic of Armenia is a mountainous country in the Caucasus region. Mountain ranges occupy almost 14 000 km2, or about 47 percent of the country’s land surface. Almost 40 percent of human settlements are at altitudes of 1 500 to 2 000 m above sea level. 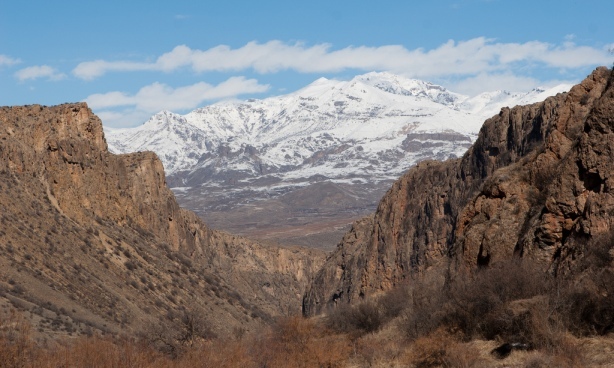 Armenian mountains face a number of challenges that need urgent attention. These include: deterioration of economic potential, and food security problems; shrinking forest areas; soil degradation; limited access to drinking- and irrigation water; unsustainable agricultural production and cattle breeding practices; low living standards; restricted access to main trade routes and markets; restricted access to information and mass media; unemployment and outmigration; and lack of public and other funds to address these issues. All of these problems are interlinked and need to be addressed in the framework of a comprehensive sustainable mountain development strategy. In Armenia, however, there was little experience of interdisciplinary, multi-stakeholder and collaborative approaches to the development and implementation of such a strategy. Recognizing FAO’s experience in watershed management and sustainable mountain development, the Republic of Armenia requested FAO, through its TCP, to assist in filling these methodological gaps and initiating action on the ground. The TCP was implemented with a national and a field-level component, and formed the first step towards a larger programme on sustainable mountain development in Armenia. A comprehensive investment programme for sustainable mountain development and implementation of the national strategy was developed with government and donor support. Capacity building was mainstreamed throughout all project activities. Through participation in the project, officials and technicians acquired knowledge and skills in sustainable mountain development. Significant national capacity was created through this action-learning process. Collaboration on sustainable mountain development issues was strengthened among government agencies and other institutions at the central, district and community levels. The involvement of technical focal points from different ministries was an important element of this. Field-level project activities established two pilot and demonstration sites for building capacity on sustainable mountain development and experimenting approaches to improving the livelihoods of mountain people. These included strengthening local institutions and field testing the national strategy. In Aragats community, a multi-stakeholder civic action group was established to guide field-level implementation of the project. The group evolved into a village association with neighbouring communities. Based on this collaborative process, pilot activities were implemented with support from local people and institutions. In Aragats, activities involving a kindergarten, an art school, a public space, a machinery park and afforestation for recreation proved to be an excellent combination for improving the livelihoods of mountain people and demonstrating integrated approaches to sustainable mountain development. In Brnakot and Salvard, pilot activities focused on young people’s needs and participation, and included renovating a public space, establishing youth clubs, providing training in handicrafts, arts and computer literacy, organizing cultural events, and participating in the formulation of community development plans. Although most of the project’s field-level impacts are clearly visible (particularly in Aragats), national-level impacts will depend largely on how effectively the national strategy is implemented and on how much support the donor community provides to the long-term investment programme developed in the framework of the TCP project. The project has certainly triggered broad discussion on mountain development in Armenia, involving students, teachers, non-governmental organizations (NGOs), national experts, mayors, government officers and others. A long-term process has been initiated and many seeds have been sown for further work in sustainable mountain development.